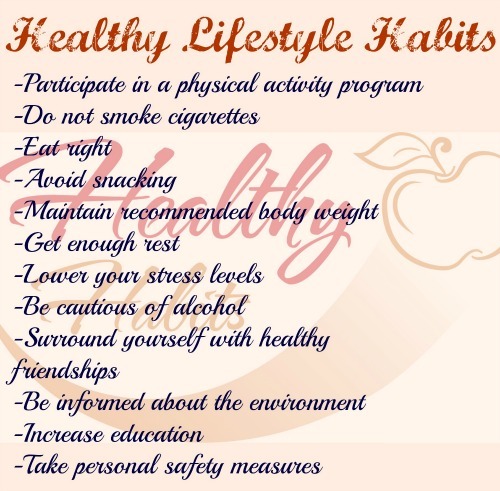 Adherence to healthy lifestyle habits will significantly improve your health and serve you well later in life. Healthy living does not need you to spend hours at the gym. It starts with simple healthy lifestyle changes that increases your energy and hence establishes healthy habits that can be maintained now and later in life. Below are 12 lifestyle habits that you can start today! 1. Participate in a lifetime physical activity program. Exercise regularly at least 3 times per week and try to accumulate a minimum of 60 minutes of moderate intensity physical activity each day of your life. The 60 minutes should include 20 to 30 minutes of aerobic exercise at least 3 times per week, along with strengthening and stretching exercises 2 to 3 times per week. 2. Do not smoke cigarettes. Cigarette smoking is the largest preventable cause of illness and premature death in the world. In United States, cigarette smoking is responsible for more than 440000 unnecessary deaths each year. 3. Eat right. Eat a good breakfast and two additional well-balanced meals every day. Avoid eating too many calories and foods with a lot of sugar, fat, and salt. Increase your daily consumption of fruits, vegetables, and whole-grain products. 4. Avoid snacking. Some researchers recommend refraining from frequent between meal snacks. Every time a person eats, insulin is released to remove sugar from the blood. Such frequent spikes in insulin may contribute to the development of heart disease. Less frequent increases of insulin are more conducive to good health. 5. Maintain recommended body weight through adequate nutrition and exercise. This is important in preventing chronic diseases and in developing a higher level of fitness. 6. Get enough rest. Sleep 7 to 8 hours each night. 7. Lower your stress levels. Reduce your vulnerability to stress and practice stress management techniques as needed. 8. Be cautious of alcohol. Drink alcohol moderately or not at all. Alcohol abuse leads to mental, emotional, physical and social problems. 9. Surround yourself with healthy friendships. Unhealthy friendships contribute to destructive behaviors and low self-esteem. Associating with people who strive to maintain good fitness and health reinforces a positive outlook in life and encourages positive behaviors. Constructive social interactions enhance well being. Researchers have also found that mortality rates are much higher among people who are socially isolated. People who aren’t socially integrated are more likely to “give up when seriously ill”- which accelerates dying. 10. Be informed about the environment. Seek clear air, clean water, and a clean environment. Be aware of pollutants and occupational hazards: asbestos fibers, nickel dust, chromate, uranium dust, and so on. Take precaution when using pesticides and insecticides. 11. Increase education. Data indicates that people who are more educated live longer. The theory is that as education increases, so do the number of connections between nerve cells. The increased number of connections in turn helps the individual make better and healthy lifestyle choices. 12. Take personal safety measures. Although not all accidents are preventable, many are. Taking simple precautionary measures- such as using seat belts and keeping electrical appliances away from water- lessens the risk for avoidable accidents. The above healthy lifestyle habits plus others that suit you can extend your life and improve your health significantly. Try them today!